Welcome to Beaver Drill & Tool Company where we have proudly served the region for over 60 years! Our family-owned -and-operated business distributes thousands of products used in a vast array of industries including: aerospace, agricultural and automotive manufacturing facilities, CNC and manual machine shops, fabrication, heavy construction, MRO and government to name a few. Over the past 60 years, Beaver Drill & Tool Company has committed to maintaining a large inventory of industrial products supported by some of the most knowledgeable people in the industry-conveniently at our 10,000 square foot distribution facility. With a local inventory of more than 11,000 items and access to many more from our supplier base of over 200 quality tool manufactures we represent-Beaver Drill & Tool has, or can get, what you need when you need it! 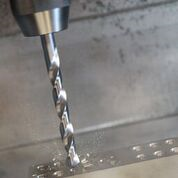 Beaver Drill & Tool offers our customers the most complete and varied inventory of twist drills in the region. No one can match the local supply we have as well as employ the people who can provide expert application information. Our loyal customer base appreciates our dedication and tenacity for providing the latest and most innovative products that help make their jobs easier and more efficient. As the industries we serve evolve, their respective processes and materials advance as well. Our customers rely on Beaver Drill & Tool to keep them at the forefront of industry advances and to secure for them the products that provide solutions regarding these innovations. If you are currently one of our loyal customers, Beaver Drill & Tool Company wants to thank you for the relationship we have maintained and assure you we will continue to strive to exceed your expectations. If you have never dealt with Beaver Drill & Tool Company, we extend an invitation to discover how we can help supply your production and MRO related needs. We look forward to bringing you into our family of loyal customers.